FDC is operating in a tent as we build a bunker. Our need for light made being in a tent at night spooky, as we made a clear obvious target. Notice the reel to reel tape player that was our source of music. Cassette tape players were new on the market; a few guys had them for music and others used them to communicate with home. Our basic equipment such as gas masks, M-16s and steel helmets are bunched in front of the FDC tent and close in case we need them. Those items went whereever we went and stayed close at hand. The open face of our bunker shows the basic design and construction plan during the dry season. 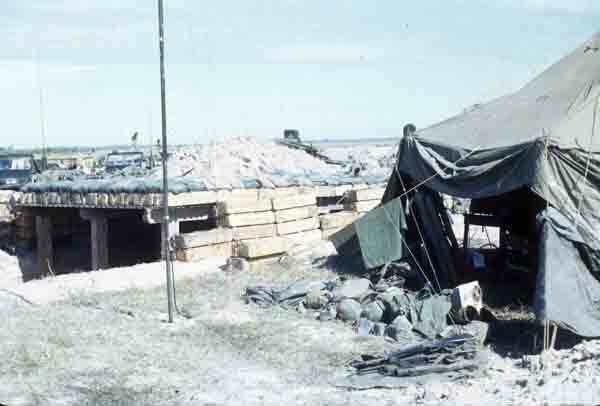 Vertical timbers support horizontal beams, PSP hollow steel plates are laid 90 degrees to the beams and trashed 105mm ammo boxes filled with the earth that was dug out to create the hole, was our first level of earthen protection. We built the short side walls with the same dirt filled boxes. Layers of sandbags were laid on the roof ammo boxes and stacked next to the short wall ammo boxes. Each day we added sandbags where needed and they were always needed.